A new mother whose baby was decapitated during a botched delivery today revealed how a 'lovely' doctor reattached his head so she could kiss and cuddle him for the first time. Laura Gallazzi, 24, was just over 25 weeks pregnant when her baby Steven died at Ninewells Hospital in Dundee in March 2014. 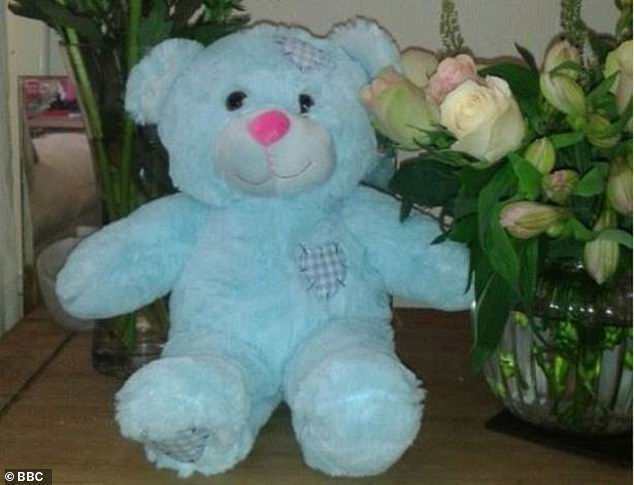 Today, while stroking the blue teddy containing her son's ashes, she told how she heard a stomach-churning 'pop' as the infant's legs, arms and torso became detached, leaving his head inside her womb. She then underwent a Caesarean section to remove the head and it was sewn onto the tragic infant's body so that she could say goodbye. 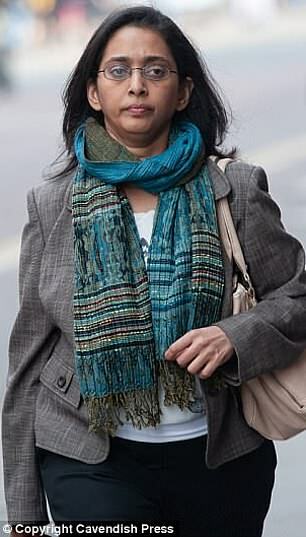 Earlier this year, a tribunal cleared gynaecologist Dr Vaishnavy Laxman to go back to work, despite finding her culpable of medical failures during the 2014 procedure. 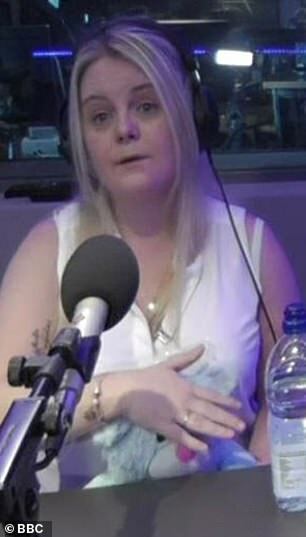 Miss Gallazzi, 34, told the BBC her baby's head was sewn back on by another medic so she could spend time with his body - but she initially said: 'I don't want to see him - don't bring him in here'. She had expected to have a caesarean as the baby was in breech position but Dr Laxman proceeded with a regular delivery. The baby's head became trapped during the birth and various techniques were tried to free it, but during this his 'head became detached from his body', a medical tribunal found. The Medical Practitioners Tribunal Service (MTPS) panel said he had died before this happened. Laura would later a blue teddy and Steven's cremated ashes were placed inside. Stroking the teddy she told BBC Scotland's Kaye Adams said: 'I felt a pop' - and initially looked at a ring on her hand believing it had snapped during labour. She said: 'I'm thinking to myself, "well, what was that?" "I felt nothing between my legs, so I thought 'I've done it. I've done it. My son's here'. "I didn't hear him crying but I wasn't too worried about that because I knew he was so small. "Then the room went into absolute chaos. "People were rushing about. There was a guy who tried to go out the room. I caught his gaze. "He kind of stopped, kind of turned back on himself and sort of continued doing what he was doing. "The next word I heard was 'right push again'. And I'm thinking to myself 'why am I pushing again? I've done it'. "I thought I'd done it. Then a couple of minutes later, it's 'oh, you're going to be put to sleep'." Ms Gallazzi added that when she first arrived at the hospital midwives helped her prepare for a premature birth and all seemed well. She told BBC Scotland: 'I was told my baby was OK.
She told the broadcaster: 'I started screaming, panicking and shouting, hitting the buzzer and all these midwives came in. 'I was taken to the first available room, put on the bed, wheeled through to theatre, put on another bed. 'I heard something about being only being two to three centimetres. My son's heart rate was dipped but it was there. Attempts to deliver the baby, named Steven, continued for another 20 to 25 minutes. Ms Gallazzi said she was 'absolutely distraught' when she was told that her son had died. The MTPS panel cleared Dr Laxman of serious misconduct. It said her fitness to practise was not impaired and ruled that she could return to work. 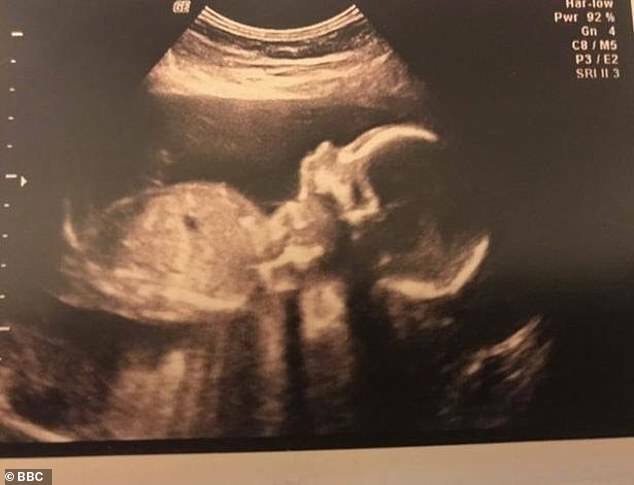 Ms Gallazzi has now launched a petition calling for a change in Scottish law to give stillborn babies a legal identity.